I began my study of Krav Maga (an Israeli martial art) in 1986 while studying in Israel under Sensei Shlomo David. Today, I train regularly under Jack Szechtel at Pro Martial Arts in Newtown Square, PA.
Michael Arlen has a birthday today. 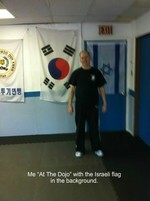 Me “At The Dojo” with the Israeli flag in the background. Here, Jack and I perform an “elbow strike” defense. My wife, Gina, and son, David also train at Pro Martial Arts under the Tang Soo Do system. Gina has earned her advanced brown belt, and David hopes to test for black belt in the near future.